Free Shipping Included! 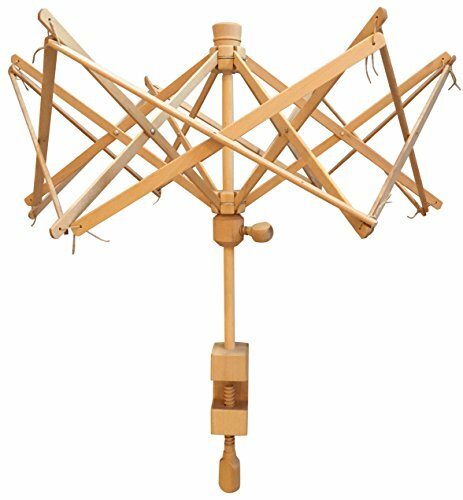 Premium Knitter Yarn Swift 24'' (One Size Fits All) Umbrella Wooden Yarn Ball Winder by Premium Knitter at Designers Artists. Hurry! Limited time offer. Offer valid only while supplies last. Foldable, Lightweight and Easy To Use The Premium Knitter Yarn swift is the perfect yarn winder on the market for holding almost all sizes of hank! The Premium Knitter Yarn swift is the perfect yarn winder on the market for holding almost all sizes of hank! The lightweight swift (740 grams/1.6 pounds)is made with high quality birch wood to provide a smooth experience when winding your hank or skeins! The umbrella style swift folds down to a great size for simply storing away ready for when you need it. - Thicker Screws: We have made our wooden screws thicker to ensure that the thread provides a reliable and strong grip every time. The yarn winder is an ideal accessory to speed up the yarn winding process for knitters of any experience! This ultimate knitting accessory is made with a sturdy wooden clamp that will fit almost all every day objects such as tables, chairs and desks. This keeps the yarn swift from moving so you can concentrate on winding the yarn into a ball. The Premium Knitter umbrella winder is backed by a 100% guarantee! We take great pride in providing one of the best yarn swifts on the market and we strive to give complete customer satisfaction. HIGH QUALITY: Made With 100% natural solid birch wood, this wooden yarn swift is machined to a high standard so that the wood will stand the test of time. ERGANOMIC DESIGN: The umbrella swift is designed so it is easy to set up and allows you to have both hands free to wind the yarn into a ball. EASY ROTATION: The yarn swift winder has a smooth and easy rotation so that it provides a squeak free experience. It also allows the yarn to be wound into a ball in the quickest time possible. PROFESSIONAL FINISH: The highly sanded wooden swift is safe for your family with no added chemicals. The smooth finish also prevents the yarn from snagging. MONEY BACK GUARANTEE: We back up our yarn winder with a money back guarantee. If you have a problem we will replace your yarn swift or give you your money back. If you have any questions about this product by Premium Knitter, contact us by completing and submitting the form below. If you are looking for a specif part number, please include it with your message.